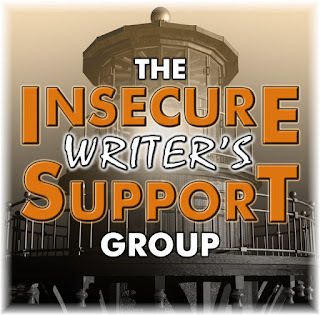 It's the first Wednesday of the month and that means for the last time in 2018, it's time for the group posting of the Insecure Writer's Support Group. Hosted as ever by the erstwhile Ninja Captain Alex J. Cavanaugh, the purpose of the group is to offer a safe space where we can air our fears and insecurities in a mutually supportive environment. Why not consider joining if you haven't already? Today's co-hosts are J.H. Moncrieff, Tonja Drecker, Patsy Collins and Chrys Fey. Although I've got the usual insecurities associated with the release of a new book - which is coming in just over two months - added to some new ones about this being a sequel (will people who liked the first book like this one? Will they even read it? Will they be shocked/disappointed/upset by the turn things are taking? ), I'm trying not to dwell on them and focusing on being festive as we dive (headlong, it seems) into the holiday period and the new year. Of course that's a time for new outlooks and mindsets and I'm going to make this one about positivity. Those insecurities will still be there, but having this space to deal with them is going to be really helpful. Something to be thankful for! 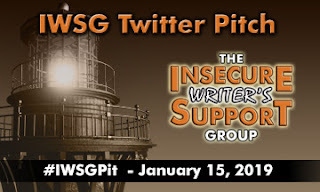 So let's have a look at this month's IWSG question: "What are five objects we'd find in your writing space?" My writing space is quite sparse because it also happens to be the dining table, so I can't clutter it up with too much stuff - it needs to be cleared every night. However, I'm sure I can rustle up five things that are usually close at hand. Notebook - I've not always been known to keep one of these around, but I'm trying to get better at that. It's great for jotting down random thoughts as they occur and trying to conceptualise how a plotline might play out. I've been making good use of the one I won from Patricia Lynne. Tea - Something else that keeps me going through the day, I'll regularly have a cup of this near to my keyboard. Dictionary - This is most often used for my day job, ie editing other people's stuff. I'll often come across technical terms with which I'm unfamiliar, and because my internet is often unreliable, it's usually quicker to look them up the old-fashioned way. I've found that very technical ones aren't always there, however. So nothing too unusual here, but I still like my writing space. If I ever get my own space, it would probably become a lot more cluttered! In IWSG news, the next Twitter pitch event is just around the corner - January 15 to be precise. Check out the details here and get your pitches in front of top editors and agents! 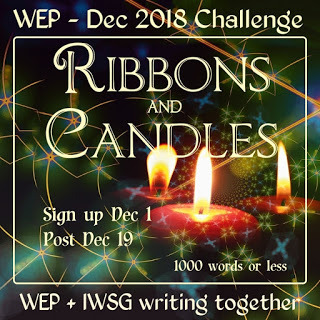 Signups are open for this month's WEP challenge with the theme of Ribbons and Candles. We're looking forward to seeing what you come up with! Check the link for more details. * I'm just going to add in a quick request for help here - I still have a few spaces available on the blog tour for my upcoming release, which is slated for February 2019. You can find details and a signup form here. Thank you! To check out other IWSG posts, click here. I have four out of the five – music wouldn't make it onto the list. I do enjoy listening sometimes, but don't feel it ever impacts on my writing. A record player? You are old school! And I write much better and faster with music playing. The nice thing about working in a space not your own is that you have to clean it up every day. My space is my space, and it's an absolute mess! Just dive into that sequel, Nick. I love it when it gets cold and I can start drinking hot tea again. I usually use a notebook or a pad of paper for the start of most of my stories - notes, ideas, lists, etc. When it gets impossible to read my handwriting, I move it all to the laptop. Congrats on getting ready to publish another book. That's so awesome! I'm glad to mention it in follower news when it releases. And I have a sparse working space too. Congrats on your upcoming books. I signed up. I can't write with music because of the lyrics--very distracting. Best wishes for a great month. How exciting you have an upcoming book! Any noise distracts me while I'm writing. I like my quiet weekdays. What a great thing... your new book. I like your setup. For some reason, I can't listen to music while writing. I love my music though, but can write and listen to my favorite tunes. Yes, the worry over a new release. Another struggle. :( Best of luck with your upcoming one. I wish you all the success. I listen to music, but it has to be instrumental for me to write to it. I can listen to something with words before I start writing - sometimes I think of certain characters with certain songs, but I can't write with words pounding into my ears. And, I can't listen to the radio because we are in an odd dead zone at our house - too many trees, hills, etc that block the signal (the same goes for any non-cable-or-internet-provided TV. We get fuzz). The only way I get music is to stream it or listen to CDs. I will go sign up to help! Hi Nick, I too have a laptop, notebook, and a dictionary, but I don't listen to music while writing and instead of tea I keep sipping water. I write in silence too. The rest of the time, I prefer music just barely loud enough to make out the words so I can think over top it. If we don't type things up right away, will we ever get around to that? heh. I have so many notebooks with random notes. I need the laptop. That makes it so much easier to find my notes (when their actual files). Hopefully some day you get your own space. I'm so glad I finally did. It's made me much more productive. I'm with you with music being a distraction while I write. However, I find that music distracts me generally. I think it's an audio-learner thing. I'm hoping for a positive start for 2019. It better not go like 2018 did, for sure! Congrats on the upcoming release! If you poke me (because I forget everything), I'll be sure to do a shout-out where I can. AS to music, I'm a silence girl. Too much noise in my everyday life otherwise. A record player might be old school for some, but I have so many vinyl gems that we bought one of the modern portable ones. Problem is that my desk is too cluttered = less productivity and internet music. My writing space also doubles as day job space, which is why I frequently end up on the couch with my laptop to write instead. I'm usually quite finished with my office by the time my day job is done. It seems as if you're firmly rooted in the mechanical age, and I have to say that is quite lovely. We need a Luddite subgroup in IWSG, so we can extol the virtues of our non-hackable equipment. I do envy people who have a writing room. But I see how it could get messy and cluttered very quickly! Music is so inspirational. Like you, I can't listen to music with lyrics while I write, but I can listen to instrumental music. Movie scores are pretty good for that. They have the emotion without the distraction. I keep waffling on using music. PS Hope your month is productive and festive. I do have a writing room, and yeah it is a license for clutter. Positive thoughts coming my way for your February release! I don't know anything about blog tours, and my blog is kind of a ghost town, but I will help any way I can. So keep me in mind if you can't fill all of your dates. Congratulations on your coming release. You have really been productive. As for what is in your writing space, I have the dictionary, laptop, and notebook. But I can't listen to music while I write. It's too distracting for me. I stop writing and listen to the music instead. Best wishes for a great success on your new book. I'm one of the few writers I know that listens to music with well known lyrics and mouth along while writing/editing. Heh... Happy Writing! I do find a cup of tea useful when writing, and I usually have one or a glass of water nearby when doing so. Best wishes on your upcoming book release! Good question. All the items in your space make sense. I have a designated writing space in a spare room, but I never use it. I wind up with my laptop on the couch most mornings. So what's near me? My laptop, coffee, a coaster, a stained glass lamp, and a tissue box. This doesn't seem very writerly!